Photo Wedding Favors! These wedding favors feature, you! Great way for your guests to remember the day.These favors feature favors that can be personalized with pictures or photos. You will find photo cookies, photo files, and other photo goodies! 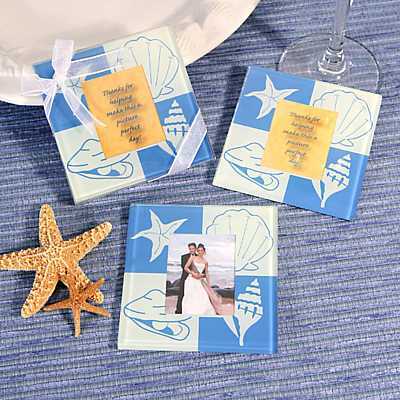 These beach glass photo coasters are perfect for your beach themed event. You can use them as placecard holders or wedding favors. You can also decorate the table with photos and tell your guests to take them home as favors. You can also give a set as gifts for the wedding party. These photo coasters are very practical. The beach glass photo coasters are packaged in a clear box tied with organdy ribbon. There are 2 coasters per box. Each photo coaster measures 3.5" square. The photo opening is 1.75" x 2". There is a preprinted message that says "Thanks for helping to make this a picture perfect day!" Price is per set of 2 beach glass photo coasters in a gift box. Minimum order is 12 sets. Black and White Photo Coasters Sentiments from your heart, surrounded by a divine, white-floral motif of blooms and leaves on a jet-black background. More than stunning glass coasters and the quintessential wedding favor, �Timeless Traditions� are the ideal combination of artistry, function and meaningful memories. The 2� x 1 �� center frame arrives with a stylized �For You� card that can be easily replaced with a favorite photo or a place card. On the back of the 3 �� x 3 �� coasters are four, tiny plastic �feet� to protect valuable surfaces. 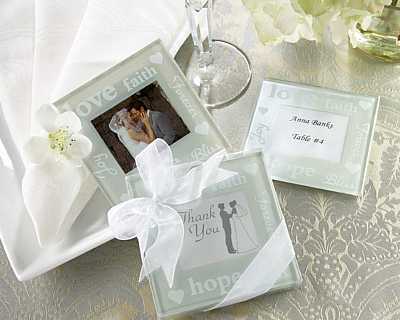 Each coaster set is beautifully presented in a clear gift box tied with a charming, white organza ribbon and bow. Each set contains two coasters. Price is per set of 2 photo glass coasters. Minimum order is 12. Card Suite Photo Coasters You�ve got the winning hand, and it�s time to display your cards. 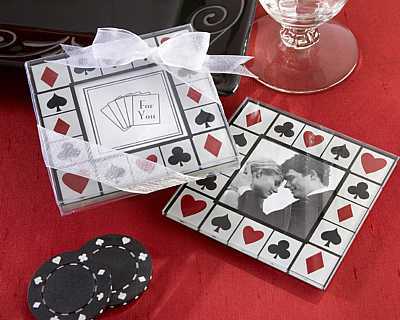 Let the �Perfectly Suited!� Las Vegas-Themed Glass Photo Coasters show your guests you hit love�s jackpot! A 2� x 2� space for a favorite photo or place card is surrounded by the red and black playing-card icons, and there are four tiny �feet� on the back for surface protection. The 3 �� x 3 �� coasters, which are presented in a clear gift box tied with a white organza ribbon and bow, come in sets of two. Price is per set of 2 card suite photo coasters. Minimum order is 12 sets. Photo bites are perfect for very memorable occasions. They are a feast for the eyes. 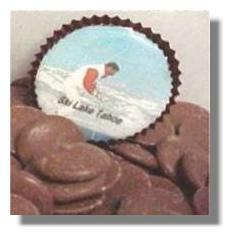 These custom photo bites have the graphic on the surface of the candy bites. These photo bites taste as great as they look. They are individually wrapped in clear cellophane bags for fresheness. Each photo bite is 1". We suggest packaging 5-10 together for each guest. They would look great in a clear box or cello favor bag. 2-3 week lead time before shipping once artwork is received. 100% edible and fruit flavored. Please email your photo or artwork to escapec@bellsouth.net If you want text, you will have to have it already included in your artwork. We can't add it for you. Please include your order number in the email. Made in the USA, Kosher Approved. Price is per embedded photo pop. Minimum order is 250. 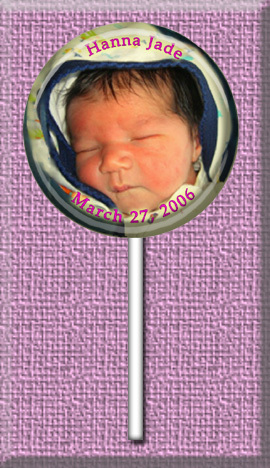 Embedded photo pops are perfect for very memorable occasions. They are a feast for the eyes. 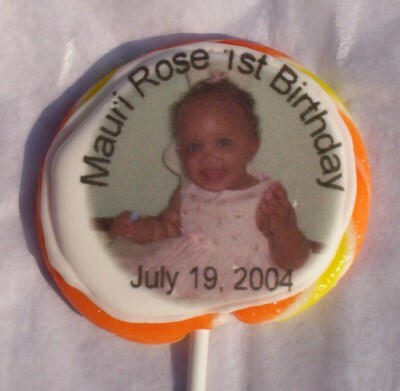 These custom photo pops have the graphic embedded inside of the lollipop to give it a 3-D effect. 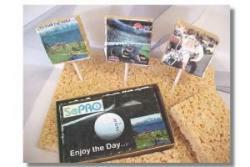 These embedded photo pops taste as great as they look. They are individually wrapped in clear cellophane bags for fresheness. The entire pop is in the bag, including the stick. There are 2 sizes available. 2"(paper sticks) and 3"(plastic sticks). href="mailto:escapec@bellsouth.net">escapec@bellsouth.net along with the text that you want added, if you want text added. Please keep it short and "sweet". Please include your order number in the email. Made in the USA, Kosher Approved. Price is per embedded photo pop. Minimum order is 144. Express shipping is recommended for warmer months and warmer climates. 2-3 week lead time before shipping once artwork is received. 100% edible and fruit flavored. You can have text added to your photo. Please email your photo or artwork to escapec@bellsouth.net along with the text that you want added, if you want text added. Please keep it short and "sweet". Please include your order number in the email. Made in the USA, Kosher Approved. Price is per embedded photo pop. Minimum order is 12. 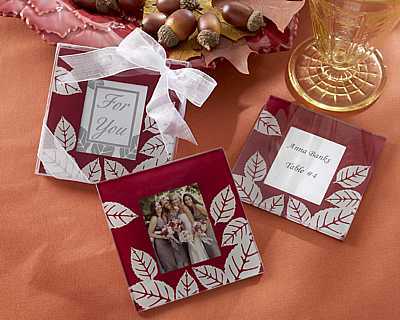 These fall glass photo coasters are perfect for any event. You can use them as placecard holders or wedding favors. You can also decorate the table with photos and tell your guests to take them home as favors. You can also give a set as gifts for the wedding party. These fall glass photo coasters are very practical. The fall glass photo coasters are packaged in a clear box tied with organdy ribbon. There are 2 coasters per box. Each favor is packaged as a set of two fall coasters and measures approximately 3.75" x 3.75" and fits photos approx. 2" x 1" Price is per set of 2 fall glass photo coasters in a gift box. Minimum order is 12 sets. These glass photo coasters are perfect for any event. You can use them as placecard holders or wedding favors. You can also decorate the table with photos and tell your guests to take them home as favors. You can also give a set as gifts for the wedding party. These photo coasters are very practical. The glass photo coasters are packaged in a clear box tied with organdy ribbon. There are 2 coasters per box. Each photo coaster measures 3.5" square. The photo opening is 1.75" x 2". There is a preprinted message that says "Thanks for helping to make this a picture perfect day!" or "For You" Price is per set of 2 glass photo coasters in a gift box. Minimum order is 12 sets. Good Wishes Photo Coasters Good wishes photo coasters will help spread your good wishes and capture the moment in classic pearlized glass. 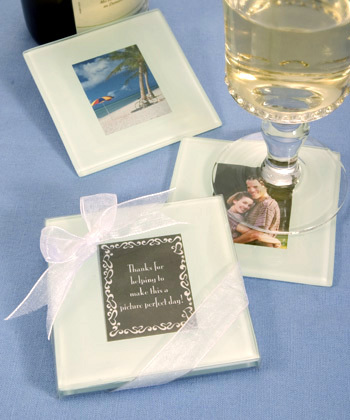 Your moment...their moments, these gorgeous pearlized glass frame coasters will protect your memories forever. Good wishes you have for the future such as love, joy, hope, bliss, faith, and forever surround the frame. Crafted of heavy high quality pearlized glass, each coaster features four padded "feet" to protect surfaces. Present your guests with these lovely gifts in any number of ways: framing a photo, used as a placecard holder, inserted with a personalized tag of your name and event date, or simply displaying our beautiful Thank You tag (included.) Guests will love being able to bring them home and use the good wishes coasters to frame their own special photos! Packaged in twos and tied with a sheer organza ribbon, these stunning coasters will add a useful "touch of glass" to any reception table or bridal shower. (Coasters measure approx. 3.75" x 3.75" and fit photos approx. 2" x 1"). Minimum order is 12 sets of the good wishes photo coasters. 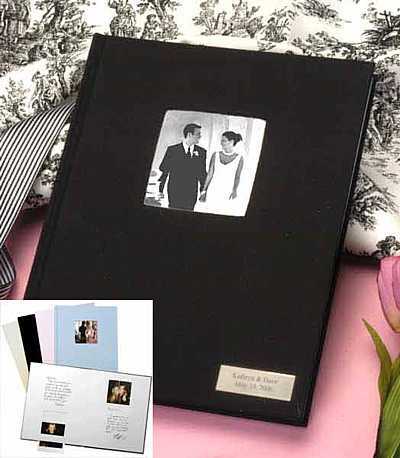 This unique instant photo guestbook makes the perfect addition to your special event. The instant photo guestbook is covered in Japanese cloth, with 30 archival pages, each custom cut to frame a Polaroid Instant picture. Each page has room for your guests to write warm wishes. Take the instant photo guestbook album to your event and accompany with a Polaroid camera to take fun photos of your friends and guests. Everyone writes their message and good wishes on the page while their photo develops. A fun and interactive way to remember your special day! The instant photo guestbook is perfect for bridal showers, baby showers, anniversaries, birthday parties, graduations, as well as weddings. Several colors to choose from. You can add a brushed silver plate with adhesive backing for easy placement of your choice. Measures 2" X 3/4". May be engraved with up to 2 lines, maximum of 17 characters per line at an additional charge. Price is per instant photo guestbook. Camera and personalized plate additional. 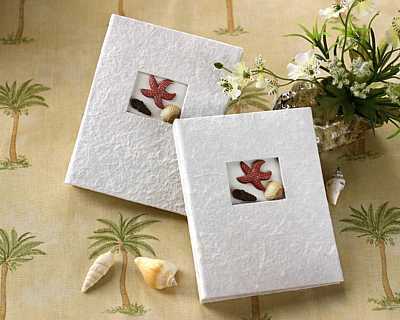 If you choose to have your instant photo guestbook personalized, put your personalization in the comment field below. 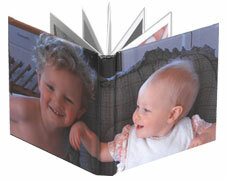 Software CD - Easy-to-use program allows you to choose your photos and print your page and album cover. Price is per 3 mini photo album kit. We do have bulk packs available for larger events. 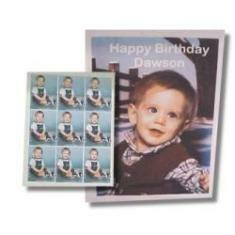 Personalized Edible Photo Paper This personalized edible photo paper is an excellent addition to your special event! Great way to personalized edible wedding favors or shower favors. You can decorate your own cake, cookies, cupcakes, or candy with this edible sugar paper! Your creations are only limited to your imagination. The paper is made of sugar and the ink is food coloring. Both FDA approved. 2 week lead time, once order is finalized with photo received in digital form. If you have to mail the photo, please put your name and address on the back of the picture. Mailing should be your last option. Most copy centers will digitize your photo and then you can email it. 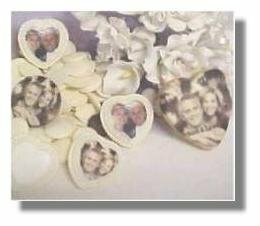 Personalized Photo Chocolate Hearts - 2" These are excellent additions to your special event! They are individually bagged and tied with tulle. These chocolates are full print, with no other printing options. You can have your names and date printed on the picture at no extra charge. This is an excellent bargain for photo chocolates! Sold in increments of 12. 2 week lead time, once order is finalized with photo received in digital form. If you have to mail the photo, please put your name and address on the back of the picture. Mailing should be your last option. Most copy centers will digitize your photo and then you can email it. Personalized photo confetti is the latest craze! Confetti featuring "you". Your bridal shower guests will love it and so will you. 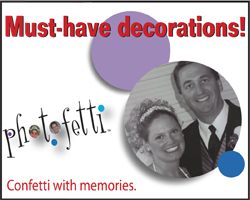 Personalized photo confetti is great for invitations, favor bags, table decorations, promotionals, everything! Have a bag of the photo confetti with each person at that table in the confetti. Mother and daddy pictures in the confetti at a baby shower. Old photos for anniversaries. So many ideas! 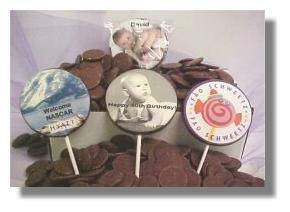 Personalized Photo Pop - 3" chocolate - 1.5 oz These are excellent additions to your special event! They are individually bagged and tied with tulle. These pops are full print. You can have your names and date printed on the picture at no extra charge. This is an excellent bargain for photo chocolate! Sold in increments of 12. 2 week lead time, once order is finalized with photo received in digital form. If you have to mail the photo, please put your name and address on the back of the picture. Mailing should be your last option. Most copy centers will digitize your photo and then you can email it. Personalized Photo Shortbread Cookies - 3" heart These are excellent additions to your special event! They are individually bagged and tied with tulle. These cookies are full print, with no other printing options. You can have your names and date printed on the picture at no extra charge. This is an excellent bargain for photo cookies! Sold in increments of 12. 2 week lead time, once order is finalized with photo received in digital form. If you have to mail the photo, please put your name and address on the back of the picture. Mailing should be your last option. Most copy centers will digitize your photo and then you can email it. Personalized Photo Shortbread Cookies - 3x3 These are excellent additions to your special event! They are individually bagged and tied with tulle. These cookies are full print, with no other printing options. You can have your names and date printed on the picture at no extra charge. This is an excellent bargain for photo cookies! Sold in increments of 12. 2 week lead time, once order is finalized with photo received in digital form. If you have to mail the photo, please put your name and address on the back of the picture. Mailing should be your last option. Most copy centers will digitize your photo and then you can email it. 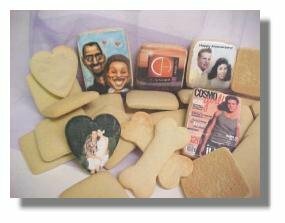 Personalized Photo Shortbread Cookies - 3x4 These are excellent additions to your special event! They are individually bagged and tied with tulle. These cookies are full print, with no other printing options. You can have your names and date printed on the picture at no extra charge. This is an excellent bargain for photo cookies! Sold in increments of 12. 2 week lead time, once order is finalized with photo received in digital form. If you have to mail the photo, please put your name and address on the back of the picture. Mailing should be your last option. Most copy centers will digitize your photo and then you can email it. 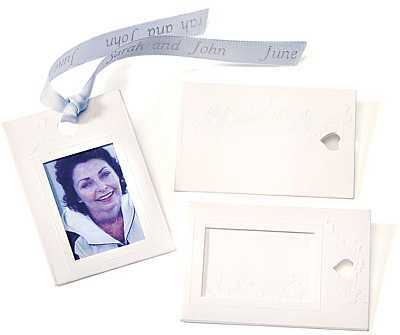 Personalized Photo Turtles - 1 ounce These are excellent additions to your special event! They are individually bagged and tied with tulle. These turtles are full print, with no other printing options. You can have your names and date printed on the picture at no extra charge. This is an excellent bargain for photo turtles! Sold in increments of 12. 2 week lead time, once order is finalized with photo received in digital form. If you have to mail the photo, please put your name and address on the back of the picture. Mailing should be your last option. Most copy centers will digitize your photo and then you can email it. Give your guests a one-of-a-kind favor with these photo magnets featuring your photo and wedding date. The 2 1/2" x 2 1/2" white magnets are printed in the two designs shown: with your photo and wedding date in circles and your names at the bottom, or one with a colorful border and your names at the bottom in white. Please specify names, date and imprint color. Please allow two extra working days. Customer assembly required. Price is per set of 48. Please email your photo in jpg format and your personalization to the email address that you receive your order confirmation. You can hit reply and attach the photo. The confirmation will have your order number and order information so that we can attach it to your order. If scanning, scan at 300dpi full size, if the original is smaller than the card size scan at higher resolution ex: 1.25x1.75 picture must be scanned at 600dpi , set the colors to CMYK instead of RGB, and save scan as tif file, rather than jpeg. We accept the following file formats: .TIF, .JPG, .EPS, .PDF and .PSD. All file formats must have minimum 300dpi/ resolutions with embedded or outlined fonts. CMYK color mode. Preferable File Formats - We can use PC or Mac originated files that are saved in TIF or EPS formats at 300 DPI, and in CMYK. - Final card size is 2.25" by 3.5". Please provide 1/8" around the edges for bleed. i.e your image should be 2.5x3.75 and keep any wording or faces in the 2x3 inch area. - The Images designed for the web is done at a low screen resolution of 72 dpi. Print images need to be created at 300 dpi or greater or there will be a substantial drop in the image quality. We can manipulate and massage these images, in many cases, but they will never be as sharp as they could be if done correctly for print originally. Normal Production Time: 15 working days. 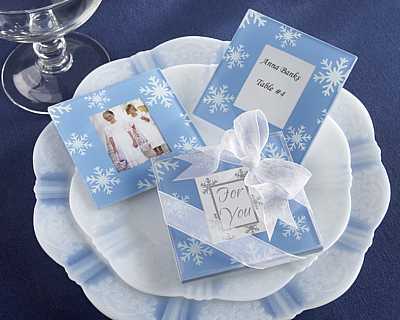 These snowflake glass photo coasters are perfect for your winter themed event. You can use them as placecard holders or wedding favors. You can also decorate the table with photos and tell your guests to take them home as favors. You can also give a set as gifts for the wedding party. These photo coasters are very practical. The snowflake glass photo coasters are packaged in a clear box tied with organdy ribbon. There are 2 coasters per box. 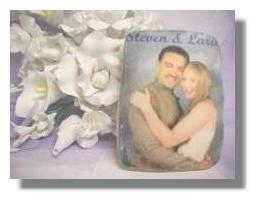 Each photo coaster measures 3.5" square and hold a 2� x 1.5� photo. Price is per set of 2 snowflake glass photo coasters in a gift box. Minimum order is 12 sets. � Wedding Favors | Bridal Shower Favors | Beach. All rights reserved.